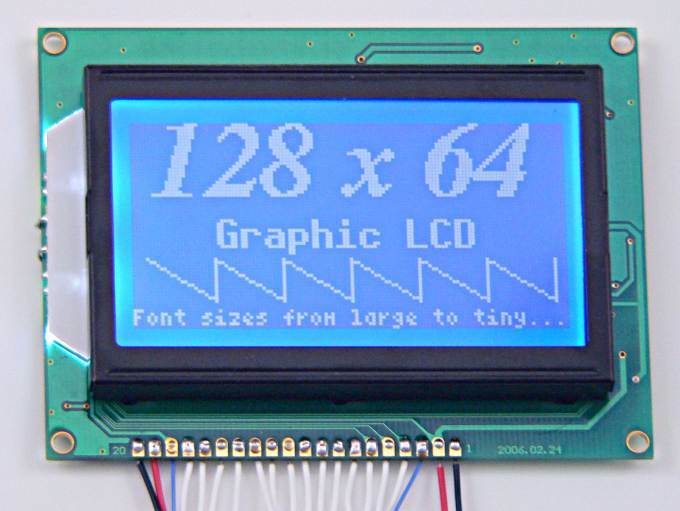 Update: This 128x64 Graphics LCD can be used with Teensy 2.0 and Teensy++ 2.0, using this library code and Teensyduino. Only two simple functions access the LCD hardware. Initialize the LCD hardware, clear the LCD and the off-screen buffer. This function should be called before using any others. Copy the off-screen buffer to the LCD. This function uses an optimized copy which interleaves access to the two chips on the LCD and minimizes overhead for minimal flicker. To actually use the LCD, you need to compose the image in the off-screen buffer using these functions, then call lcd_update() to display it. Set the position where text & shapes will be drawn. Set the font. To use a font, #include "lcd_fonts.h" (which has definitions for all available fonts). Just pass the font name to buf_set_font. You must also compile and link the corresponding .c font file into your program. Print a character. Normally this is called from putchar() and putchar() is called from printf(), so printf can write directly to the LCD. The character is rendered using the current font, and the X position is advanced by the character width. The Y position is NOT advanced. Draw a shape at the current X,Y position. This is used by buf_putchar() to render the character. The binary data format required is only documented (so far) in the source code and a perl script "bdf2c.pl". Perhaps someday an easy-to-use tool will allow user created shape data to be created? Turn on a single pixel at X, Y. Clear the buffer. This does not clear the actual LCD, only the off-screen buffer. As an alternative to using a 5K pot for the contrast adjust, you can use higher impedance values with a PNP transistor. A 2N3906 or almost any other small general purpose PNP transistor should work, allowing any pot value between 10K to 250K. Update: Pin 17 can be connected directly to +5 volts. 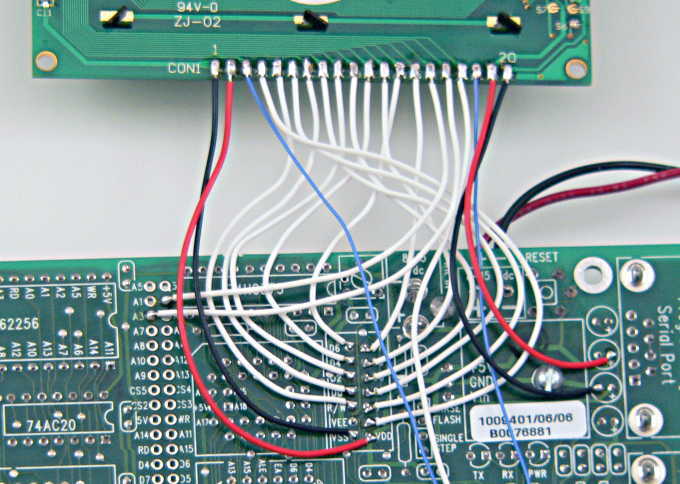 The 22K resistor and 10µF capacitor are not necessary. Extensive testing has shown this LCD works fine without a pulse on its reset line.